Drontal Worming Tablet for Cats kills every type of worm your cat's likely to catch, making it a great choice for regular worming. There are eight different types of worms that cats can catch in the UK and they're all super easy to pick up. This means that it's really important to worm your cat every three months to keep them healthy. If your cat has worms that aren't treated, the worms can reproduce in your pet's tummy and cause serious illness and pain. Tapeworms also lay eggs, which can leave your cat's body and infect people, especially children. If your cat lives with children or spends time around them, it's especially important to be sure that they're completely worm-free. As well as using Drontal, you can talk to your vet about the best ways to protect your family, friends and pets against worms. Some worms can be spread via flea eggs, so it is recommended that you treat your cat with Advantage 40 Spot On at the same time. cats can keep eating normally during treatment. 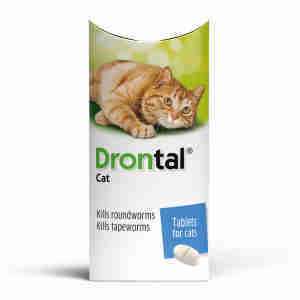 Unlike some other wormers, Drontal Worming Tablet for cats is designed to be a comprehensive medication, meaning that it kills all eight of the UK's most common roundworms and tapeworms. If your cat already has worms, Drontal makes it super easy to get rid of them. Just one dose, with or without food, is generally enough to kill any worms in your cat's tummy. To stop them coming back, it's a good idea to write a reminder in your diary to give your cat Drontal again every three months. Each tablet contains 20 mg Praziquantel, 230 mg Pyrantel Embonate, 1.8mg of Titanium Dioxide (E171). Administer to your cat on its own or with food. Treatment should be repeated every 3 - 4 months to keep your cat safe from worms. For cats that weigh more than 6kg, use Drontal XL for Cats. Easy to administer and no apparent side effects to my cat. Always arrive quickly and a really good price! These tablets are great value for money. A lot cheaper than where I used to buy them from. Very happy with my purchase.